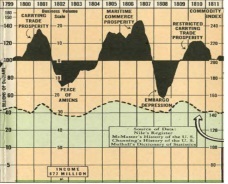 This image, from Business Booms and Depressions Since 1775, shows one boom-and-bust cycle. A depression is a period of sustained downturn in economic growth and activity. A (banking) panic is a type of financial crisis affecting banks across a region or country in which bank customers lose confidence and withdraw their deposits, leading to bank failures. Panics and depressions are often linked.